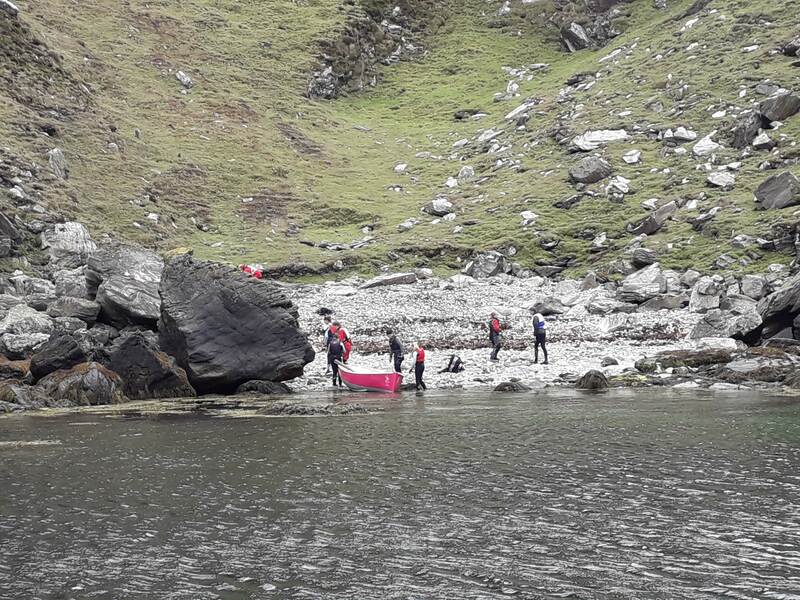 In a five minute beach clean at a tiny and remote cove called Aldrick on the Isle of Man, our sailors filled a small boat load with plastic….. There was still more left. “This is an impossible task” commented one of our Instructors upon seeing the size of the problem on this tiny beach. “Scale this up across the globe” I replied. Yesterday was pretty awesome. The Day Sailing group planned an outing down to Aldrick. They enjoyed fantastic sailing conditions down the coast and back. Piglet even came for the trip so we could get ashore. We anchored the boats off the beach and the crews had fun rowing to and from the shore. We stopped there for a picnic lunch, it was a real treat. There was a lot of plastic on this beach. In just five minutes our sailors cleaned a boat load of plastic off Aldrick beach. We talked about the Great Pacific Garbage patch (I was surprised how few people had even heard of this), we talked about Rowan Henthorn’s trip across the Pacific researching the impact of plastics in the oceans. We talked about the global problem and future implications for marine life, bird life, human life and the planet. We can see the same here, on a smaller scale, outside of our bay is a gyre, plastic just keeps going round it in circles. Our boat load full is just a tiny sample and no doubt more will appear on Aldrick tomorrow. We will continue to pick up plastic we find on beaches and in the oceans. But we need to stop it at the source. Youth Sailing Week #3 More girls than boys! Youth Sailing Week #3 and what a week. It started with the beach being closed due to a diesel spill caused by a visiting boat. Not to be deterred we managed to run a session from the jetty, away from the slick, using the boats we already had on moorings in the water. On Tuesday lunch time the Coastguard and Commissioners declared the beach open again. There we were, our boats lined up like super cars waiting for the Roads Open after TT races, just waiting for the nod. What followed has been a superb week of sailing with near perfect sailing conditions. We’ve some new additions to the Instructing team, Luke Crowe and Annis Williams both passed their DI course last week and this week have run a text book Stage 1 and 2 course between them, with help from Ealish Green who has joined us from across for a few weeks. 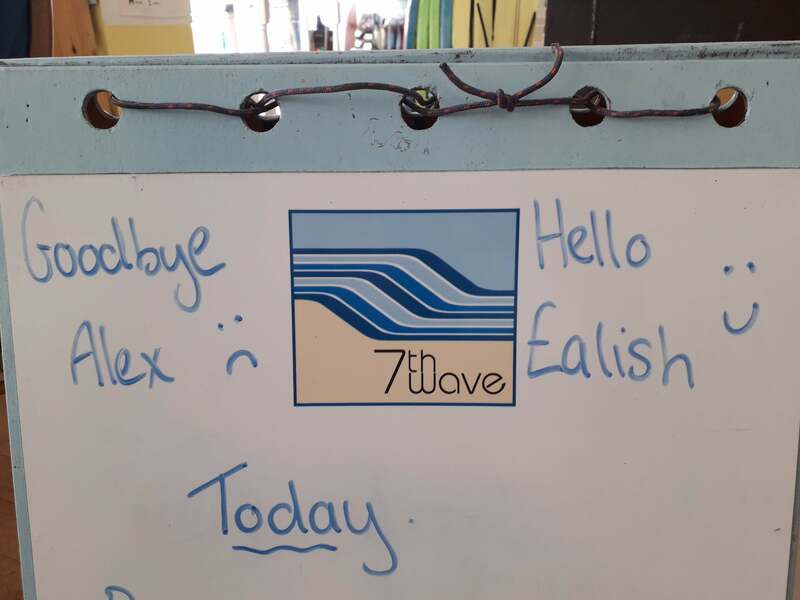 Ealish has spent much of her sailing career at 7th Wave and got her DI ticket here last year. She has been teaching sailing at Budworth SC and now here, she is a welcome addition to the team. Finally it is wonderful to have Ffinlo Wright back in the fold too. Ffinlo was our first ever ever sailing customer back in 2006, I took him on a Taster Session in a Tera, he was five years old! Well after the last few months on sunshine, this weekend is looking more like a regular Manx summer – wet and very windy! Well, I’ve seen some incredible things in life, but this was something else. 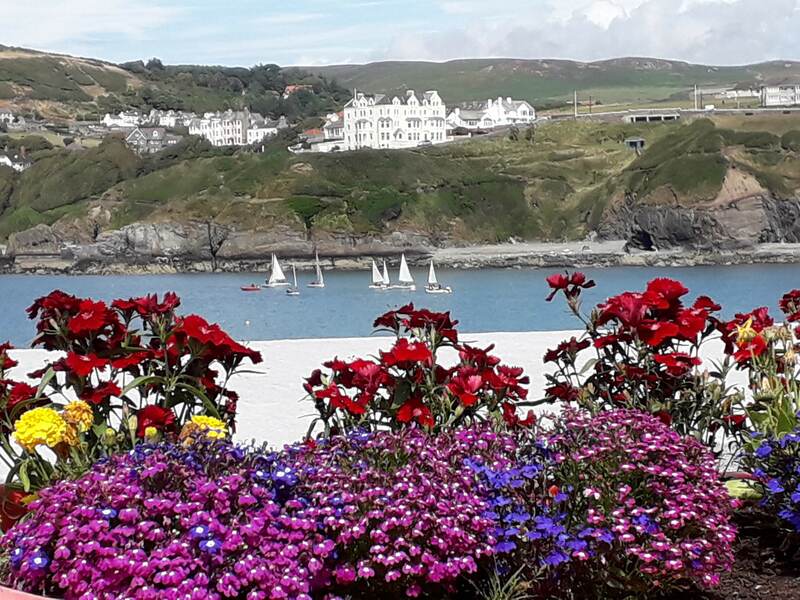 Port Erin bay has delivered yet another scene right out of Attenborough’s Blue Planet. Yesterday we were treated to forty or more dolphins chasing what must have been a mighty good feed of something. They were in the bay for a good half hour at just after midday and then, they came back for around an hour between 2.30 and 3.30pm. RYA Coach Assessor Alan Jones and our Dinghy Instructor candidates had front row seats. “Seeing the dolphins playing under and with the boats was the most amazing thing I have seen in my life” said trainee Instructor, Sarah James. In the afternoon our Stage 3 sailors had their own little show as the dolphins swam to within a few hundred yards of the beach. From the surface I watched them swimming round their food source, making tighter and tighter circles, then the ones in the middle of the fray would breach or tail slap the water before the whole group would dive as one. They kept repeating the same pattern from Bradda Head to the middle of the bay to Traie Meanagh. I have never seen anything like it, never seen so many dolphins, never watched them hunting…. and all of this happened on our doorstep, in our bay!!! 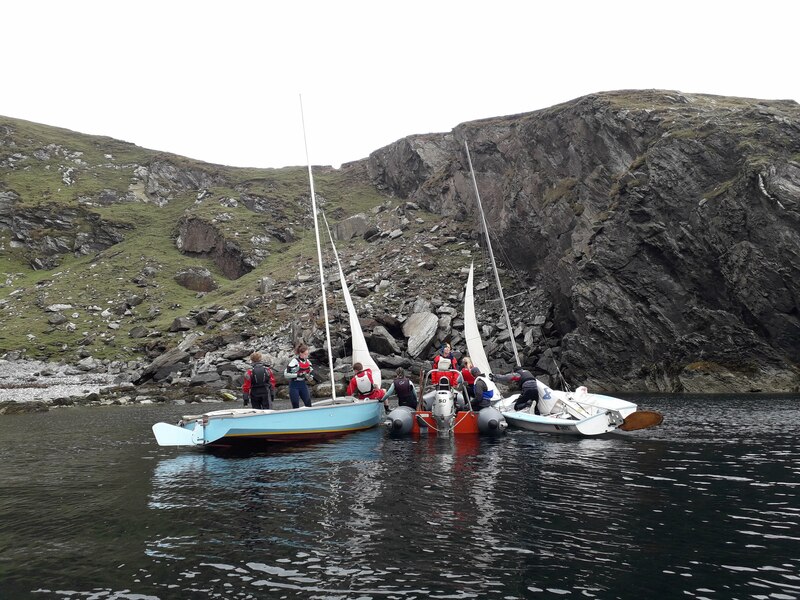 Last week saw the first of this summer’s Youth Sailing Weeks, we had 24 young people here ranging from Stage 1 sailors right through to our trainee Instructors. 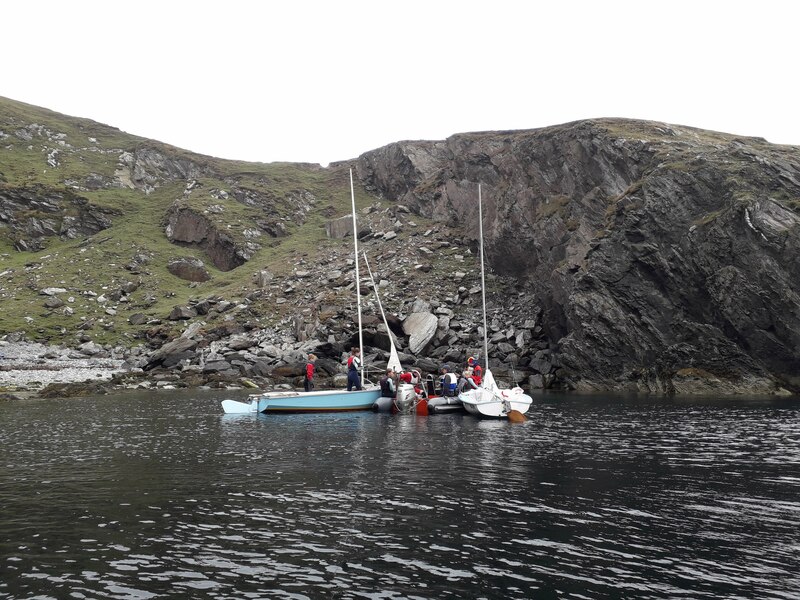 The rudderless sailing bar was raised significantly by Luke, Nathan and Charlie who sailed the Wayfarer back on to its mooring, first time, first attempt – no rudder! On Friday we witnessed a textbook RYA session, led by the trainees, overseen by our Instructors. Very proud of watching these young people grow up and we wish them well for the Dinghy Instructor course this week. Over thirty women took to the water last weekend with our This Girl Can events. The weather can only be described as perfect! We had sunshine, just the right amount of breeze, nice flat water and it was warm too. 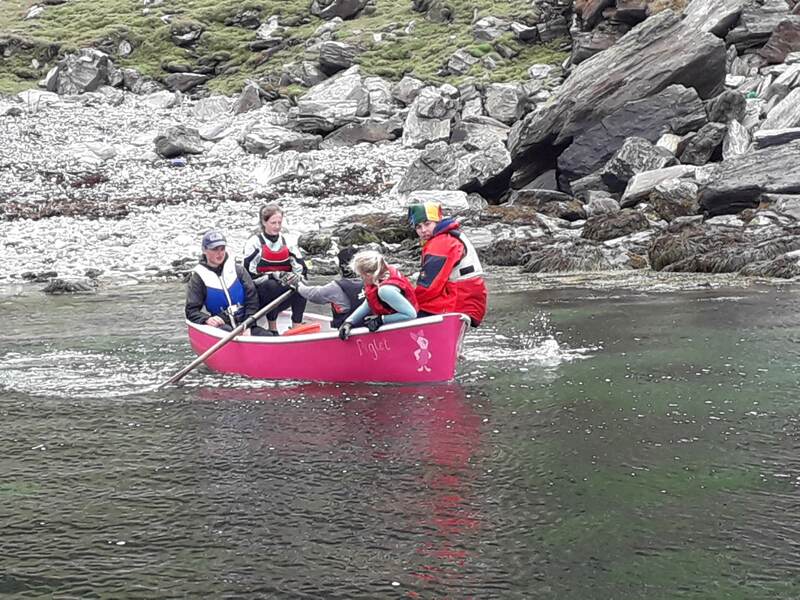 The ladies signed up for Powerboat and Sailing Taster Sessions were in for a real treat and we all enjoyed the best that the Isle of Man has to offer. Izzy led a This Girl Can Start Racing weekend and we were delighted to have ten junior girls sign up for the weekend. The course started with race training and boat-handling exercises culminating in a three race regatta on Sunday afternoon, before the wind died completely and the session ended with capsizing games and some cooling off in the water. 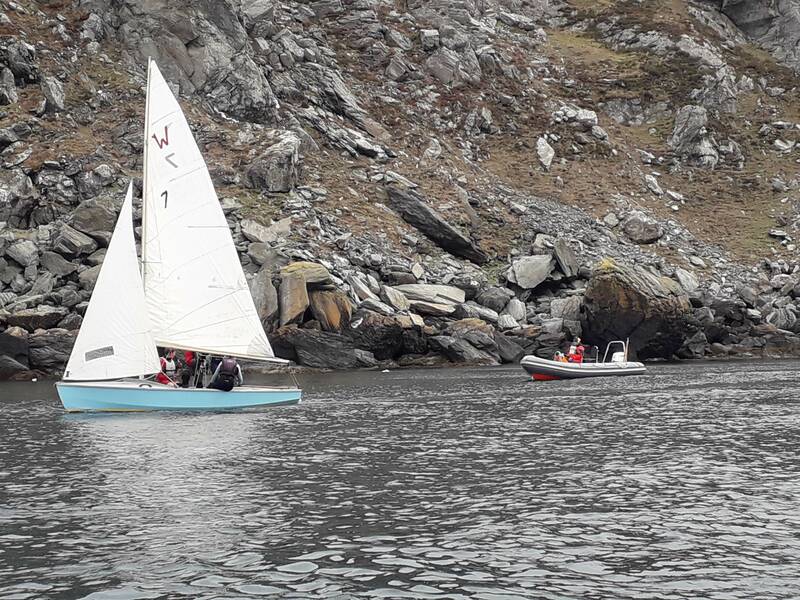 All ten girls were awarded the RYA Start Racing certificate and we have found ourselves some new talent for the 2019 Manx Youth Sailing Squad. The concept grew to extend the This Girl Can weekend to encourage more women on to the water and with Foraging Vintners on our doorstep we combined powerboat and sailing Taster Sessions on the water with a taste of pink fizz in the sunshine afterwards. 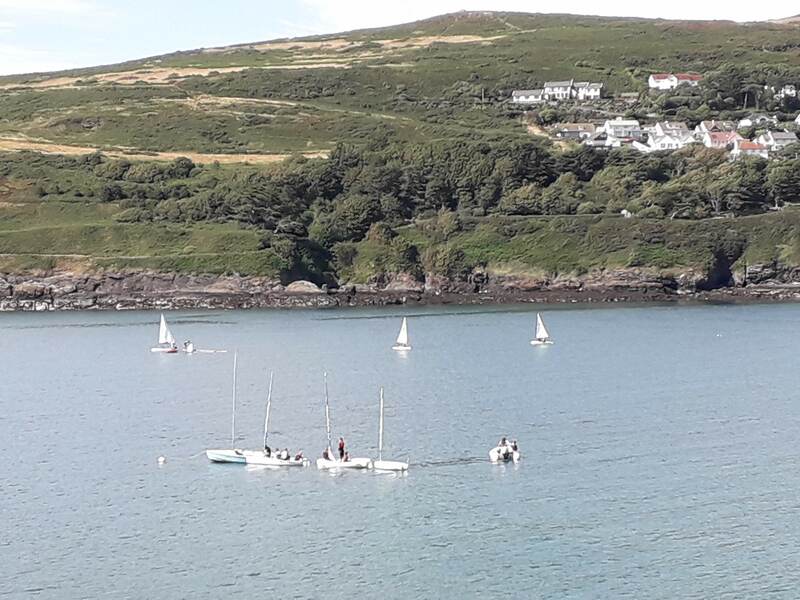 Sailing sessions were really popular and of course on such a glorious day, our instructors were keen to get on board and have a sail too. Ladies were treated to a lap of the bay while they got feel for the ropes and by the end of each hour long session everyone had taken the helm too. We couldn’t have asked for better conditions for powerboating and there was plenty of smiles and laughter as we opened the throttle up and started planing out to Bradda Head, slowing at the mines round the back of Bradda to take in the stunning scenery, dramatic coastline and the abundance of seabirds and wildlife. “I arrived on the island by ferry seven years ago and I haven’t been in a boat since”. 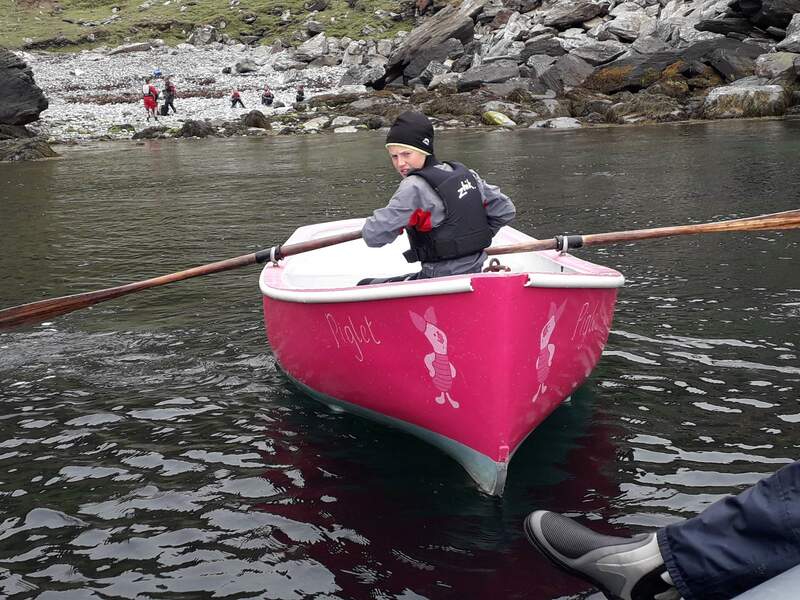 Twenty minutes later Lisa Salinardi was at the helm of the RIB, blasting toward Niarbyl wearing the biggest of smiles! Powerboat and Sailing Taster Sessions continue all through the summer and it’s not just for the girls. #Everyonecan! Gotta love having young folk working here… Something new every day!